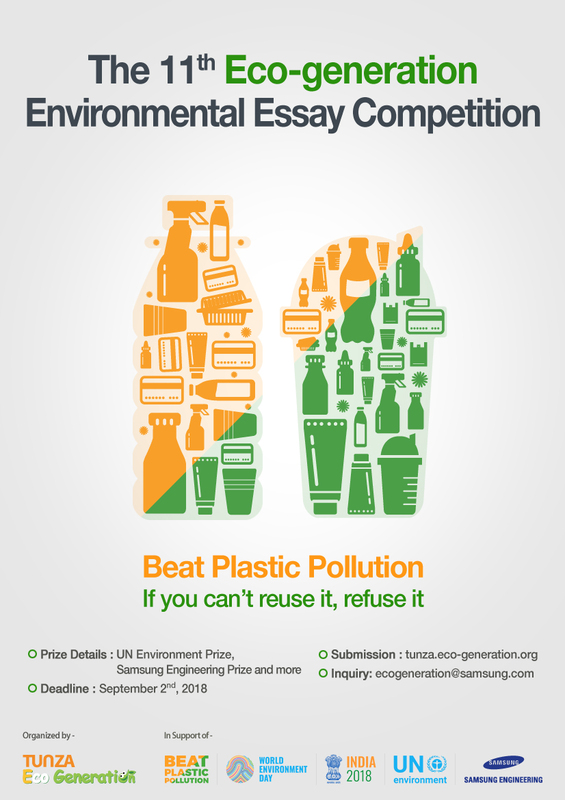 Samsung Engineering jointly with UN Environment would like to launch ‘The 11th Eco-generation Environmental Essay Competition’ inviting the youth all over the world to raise awareness on the theme of the upcoming World Environment Day – Beat Plastic Pollution. ‘Beat Plastic Pollution’, the theme for World Environment Day 2018, is a call to action for all of us to come together to combat one of the great environmental challenges of our time. Chosen by this year’s host, India, the theme of World Environment Day 2018 invites us all to consider how we can make changes in our everyday lives to reduce the heavy burden of plastic pollution on our natural places, our wildlife – and our own health. Tunza Eco-generation members aged between 14 and 24. ‘Beat Plastic Pollution, if you can’t reuse it, refuse it’. Inspiring and creative ideas on how and why we should reuse and refuse it. Write ‘your motivation to join the competition within 50 words’ in the Content box and attach your essay file (MS Word) in the attachments column and click Submit button. Entrants must first register at this site in order to submit their essay online. All entries must be double-spaced in 11pt, with numbered pages in one of the following formats. All other formats will be disqualified. The personal information in the entry must be correct. If any competition winner is not reachable due to wrong information (contact number, address and etc.) prize will be canceled and automatically be given to the next place applicant. All entries are final. No revisions are accepted.